As much as the Interogator was an incredible figure attached to a throwaway vehicle, the Heli-Viper tips the scales back. You wouldn’t think that Hasbro would spend a lot of effort including a great newly designed figure with a vehicle that was all gimmick. I’m sure the designers figured the kid that bought it would zip the thing into a tree within five minutes. Or in the case of an eighteen year old geek, into the ceiling. If it succeeds in something, it’s solely due to the awesome source mold of the body. The Night Viper is a wonderfully detailed figure, abd loaned its torso and legs. The Night Viper’s rifle that attaches to the leg is one of my favorite elements of any vintage small Joe figure. 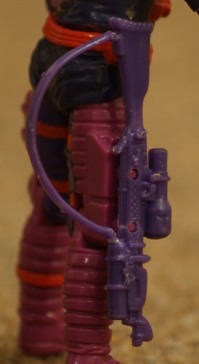 Techno Viper arms fit in well enough, with their sculpted hoses. The head is where it falls apart, mold wise. As much as I love the Snow Serpent, the head doesn’t work as anything else, especially when it’s not sitting atop a set of fur covered shoulders. This has got to be one of the quirkiest parts combos they ever came up with in the original line. Can’t believe I never realized the figure had night viper parts. Something about the figure’s head kills it for me. I think the Night Viper parts are great, and honestly, I don’t mind the Snow Serpent head up there. I think it makes sense to have a stoutly built helmet with goggles for a pilot like this. Those paint jobs killed it right out of the gate but the parts themselves work okay together. I wonder how it would have turned out in classic Snow Serpent or Iron Grenadier colors? Well, thanks to the 2005 convention Iron Grenadier, we know how the Night Viper mold would work in those colors. I wonder how the figure would have worked with that purple but instead of bright red, maybe a burgundy red? I wonder how rare this figure is. I never see it in lots or loose by itself. Hey, the Snow Serpent changed uniforms in 1991, so it makes sense Cobra would repurpose some of their old gear. By then purple was close to becoming the standard Cobra color. Their filecard says they are elite, but maybe that’s to make them feel better when they are strapped to suicide machine with no offensive weaponry. I’d rather take my chances in a FANG. Yeah, the colors here kill it. Red and purple is a terrible color combination. This figure is kinda rare – meaning valuable depending who is getting rid of it. Honestly, there’s not much to like, but another collector re-purposed them as helicopter assault troopers (foil to Airborne), and with a little paint it works. The Snow Serpents were supposed to be elite, so what if the same guys were jumping out of the sky? Still not sure about the purple, though. While the colors are ghastly, I think Hasbro might be onto something using the Snow Serpent head with the Night-Viper body. Now that we’re going to be getting a Night-Viper in 2013, perhaps Hasbro (or atleast some customizer out there) can give the Heli-Viper another try…but hopefully with better color choices.